APA provides its members with information and resources to do their jobs effectively and advocate for best planning practices in the communities where they work. The environmental and economic impacts of climate change on communities are a continuing focus of APA's research efforts. In fact, climate change was rated the top priority by APA members who responded to the Research Agenda Task Force Survey. In January 2017, the Kresge Foundation recognized APA as one of nine urban-focused professional membership organizations for its efforts to educate members on climate change issues. The following climate change resources are available from APA. See the Disaster Recovery Resources page for additional hazard mitigation information. APA's policy guides represent the collective thinking of our members on positions of both principle and practice. They represent APA's official position on issues central to building communities of lasting value. APA conducts applied, policy-relevant research to identify, evaluate, develop, and disseminate best practices that address key issues for the planning profession. Below are highlights of completed research initiatives with a climate-change focus. This multi-year effort examines how places can be sustained and how places themselves sustain life and civilizations. 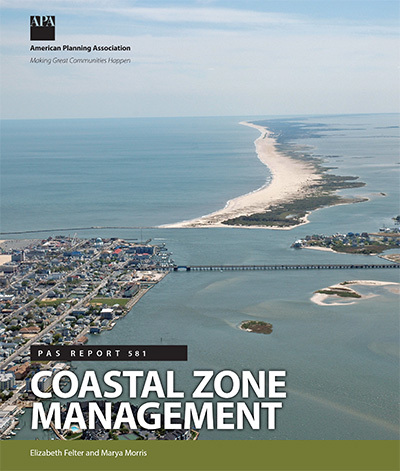 As part of this initiative, APA developed the Comprehensive Plan Standards for Sustaining Places Recognition Program that defines a set of principles, processes, and attributes to guide comprehensive plan creation. APA has produced a number of reports that address climate change and aspects of climate change. Digital access to PAS Reports, PAS Memos, and PAS QuickNotes is available to all APA members and PAS subscribers. Non-members may purchase digital copies of all three publications. PAS Memo is a bimonthly publication written by practicing planners that offers insights and case studies. Roundtable discussion with the coauthors of Planning for a New Energy and Climate Future. The Planning Information Exchange (PIE) quarterly webinar series is sponsored by APA and the Association of Flood Plain Managers, with funding from the Federal Emergency Management Agency (FEMA). The webinars are free. "Rising Seas" Closing keynote by John Englander, oceanographer and author of High Tide on Main Street. "NOAA Supporting Resiliency" by Dr. Kathryn Sullivan, former Under Secretary of Commerce for Oceans and Atmosphere and NOAA Administrator. NOAA and APA have a long history of collaboration focused on helping communities cope with drought and floods, improve water quality, and reduce coastal inundation among other threats. Learn more about the work underway and how NOAA is working to build living and thriving communities. APA offers opportunities for members to connect with others who share their interests. Learn more about all APA Divisions and Interest Groups.